EXTRA DISCOUNTS: Purchase this item by itself or with any other items from Danly's category to receive an extra discount based on the total value of category products in your Shopping Cart. Click the link for more information. Danly DieMax™ XL Die springs are manufactured in lengths, diameters, and load classifications that conform to the ISO 10243 International Standard and the NAAMS (North American Automotive Metric Standard). The specification includes color coding of each spring for load identification. 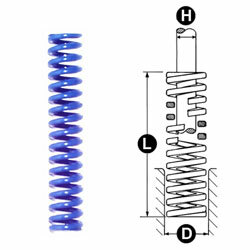 ISO 9002 registered quality means that these springs are manufactured to ISO 9001: 2008 quality standards consistent with the DANLY reputation. The coils are a spring quality chromium alloy. The coil cross section is round to provide less force than the Danly springs having a "D" shaped cross section. This is the medium load series that provides more force and has shorter travel to solid than the green Danly round wire springs. The color code is blue and there are 30 standard sizes. The available major diameters (D) are 3/8 to 5/8 inches. The available length (L) are 3/4 to 12 inches. Please contact us if you need a different size, or if you need us to make any alterations. SHIPS FROM: Danly products are sent directly to you from our warehouse in Dayton Ohio.